yeah, that is what I thought, but it seems very high up the supports... is there a second launch? Or does the track immediately turn back round and go up there? Because any more than that and the coaster surely won't have enough speed to get back up that high? PLUS, more to the point, the other track connectors appear to have square plates on them, not round ones. These "things" are no track connectors. It's possible that they are going to build up a wall on the connectors to reduce the noise if it's too noisy in the village next to the park. Yes indeed, I watched it the other day. There's a NL coaster somewhere going around on the net which is inspired by this lay-out. I dont really think the lay-out is that special, to be honost. But I do know Mack is not going to throw some default thing in Europa Park. They never do, so what are their plans? They where talking about a world exclusive thing? The lay-out isn't world exclusive, and a launced coaster aint exclusive either. So what is it then? Is it going to be a launched spinning inverted flying coaster or?? Mack is pretty innovating, so I see them build something pretty spectacular. 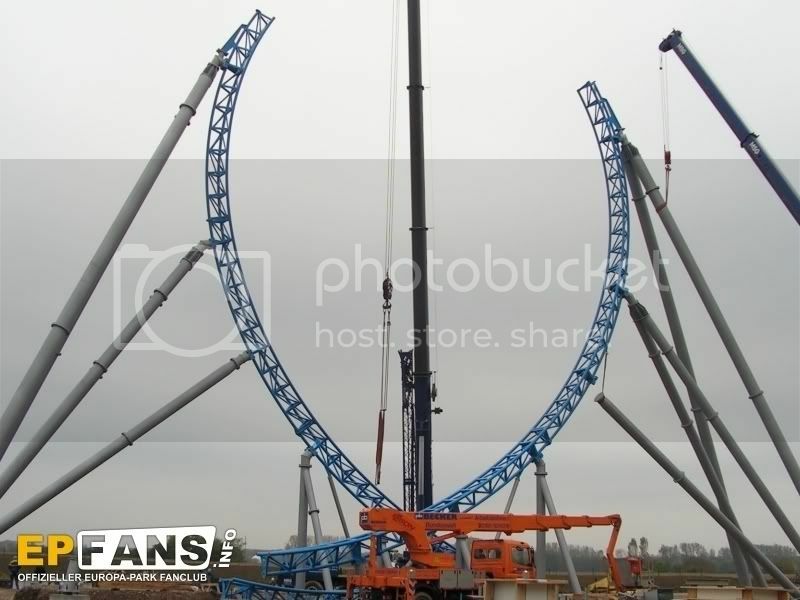 I would be disapointed when they say the new world exclusive thing would be the part that Mack is going launched plus Mack is going to use inversions for the first time..
Ow by the way, here's the onride of the NL coaster I meant. K so well basically I'm going to go spill some blood in the sink for not being able to ride this. The top of the loop didn't fit correctly! How did that manage to happen? But as far as I know it wasn't the angle of the picture. It didn't fit.. This ride looks very neat! I'll try to arrange a trip there in May! Same for me.. I'm going in April with some friends. Hopefully the coaster is done! Today Europa Park made it official. In April it's going to open it's new coaster. It's going to be 44 meters high with a 40 meters high looping, making it the highest looping of Europe. It's going to have 4 inversions in total. 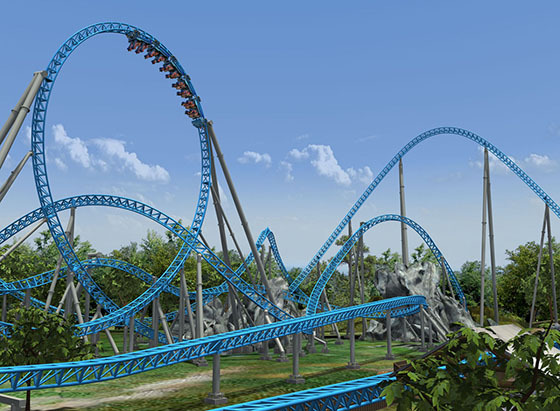 The coaster will be launched from 0 - 100 km/h in 2.5 seconds and will offer a +/- 45 seconds dark ride before the launch. More important, the coaster is going to use some new technology ( I'm not sure what they are going to use ) so the over the shoulders restraints are not needed!! So NO OVER THE SHOULDER RESTRAINTS! What do you guys think? Cool or not? Anyway, It's very cool. I wonder what the Dark Part will be like. That was the reason of the loop "not fitting correctly." They needed to put in another piece under the loop, it fit fine, just a misunderstanding. Ok, thanks for the information.. I made a mistake about the height though. It's going to be 40 meters high and a 32 meters high loop. Ok, a teaser is up.. The ride has been announced by Europa Park! The ride's layout looks fantastic, nice job Mack. Top speed: 100 km / h.
Specialties: A combination of Dark Ride and launch Coaster. That layout looks sick! This ride look really good. I'm allready planning a trip there for the next year! Yeah that's definitely a similar concept. Part of the point of the shaping is to kill the approximately -1g you'd get on a normal heartline roll, which, if you also have fast rotation, can be uncomfortable it seems. btw yeah you could do that with FVD, and that's probably the best way to do it now, but for Breaking Point I made the roll with probably some combination of HSAK or one of redunzelizer's wizards and AHG. Mack! We may have a new favorite company after this. great ride... going to visit it next year. It would be a shame if they would fit a soundscreen on top of the sort of horseshoe. Europe in general finally gets some great rides!!! A wall for decreasing the noise would be weird. 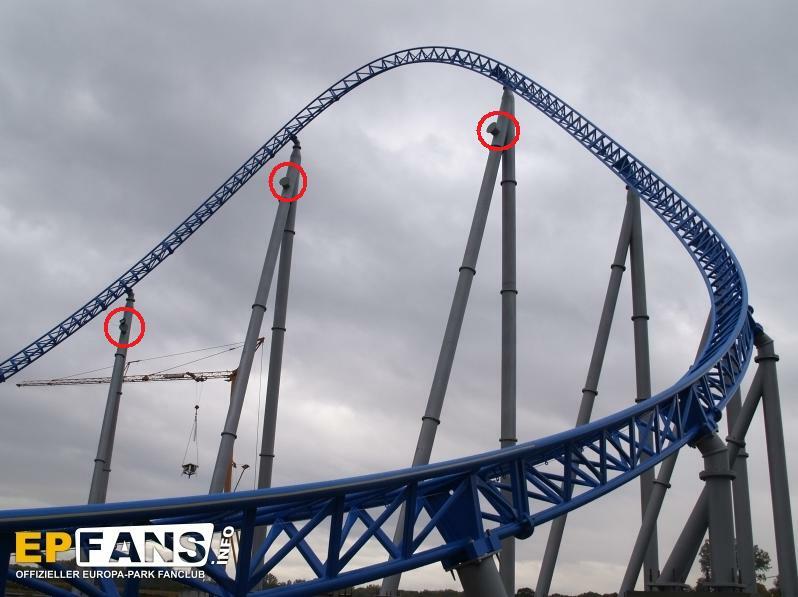 The looping is almost just as high, so then you need a wall there as well. I don't know where the connectors are for, though. The noise decreasing wall could be needed for Rust ( the vilage that's near ) and if you look at the position of the turn and the connectors and then think Rust is in the right spot for the wall, it could be more then possible that some sort of wall will be build. Wow this looks incredible. And is it just me, or does the teaser video remind you a lot of Maverick's first commercials? Where does everybody see the layout? Just from that one picture up there?